This week we will continue our discussion from last week about the last Ice Age. This time, about humans. How did we get to the Americas? And I’m not talking about Christopher Columbus, because we all know he encountered American Indians. But how did those first people arrive on this continent? 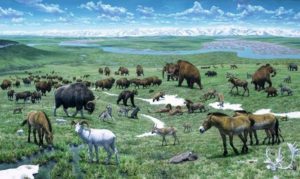 A new [article], published this week, takes us back to the last Ice Age, around 14,000 years ago. 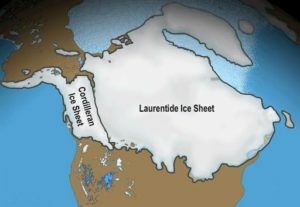 At this time, two large ice sheets, the Laurentide and the Cordilleran Ice Complex, were covering most of Northern North America. In some places, these ices sheets were up to 2 miles thick. 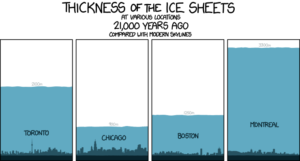 The thickness of the ice sheets at different cities 21,000 years ago. From here. These ice sheets made it impossible for people to walk from Easternmost Russia to Alaska, or from Alaska to Canada and the more southern parts of North America. So people had to wait for the ice sheet to melt before making it over to the Americas. Also, once the ice melted, it left a giant lake that needed to shrink before people could cross it. Before now, the timing of when this ice sheet opened was not well worked out. The Laurentide and Cordilleran ice sheets. From here. This study took sediment cores from lakes (like we discussed [last week]) and looked at all the DNA, small organisms, pollen, isotopes, and the sediments themselves that were present in the cores to test how the environment was changing from 14,000 to 11,000 years ago. The authors found that before 12,600 years ago there was little to no plant life in this region. Between 12,600 and 11,600 years ago there was steppe vegetation present. This type of vegetation creates a habitat for many animals like elk, moose, jackrabbits, voles, birds, and fish. The steppe environment by J. Matternes. After 11,500 years ago the lake had more green algae, but also had evidence for poplar trees in the area. These trees provide habitat and food for many animals, and wood for fires and tools for people. So the authors conclude that a corridor through the ice would have been present starting around 12,600 years ago, with enough plants and animals present to support humans. One last piece of the puzzle makes the story more complicated. There are human artifacts in the Americas starting around 13,400 years ago. So how did those people get there? The authors think that there were 2 pulses of immigration to the Americas. An earlier one from the coast, and a later one through the ice sheet. As always, more information will help to answer these questions. 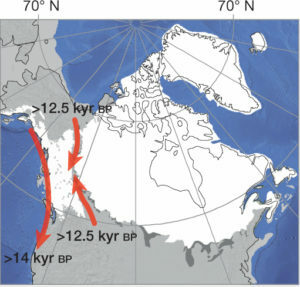 Figure 4 from the paper showing the two migration routes and their potential timing. Kyr means thousand years ago. This entry was posted in English and tagged Humans, Ice Age, Migration, North America. Bookmark the permalink.